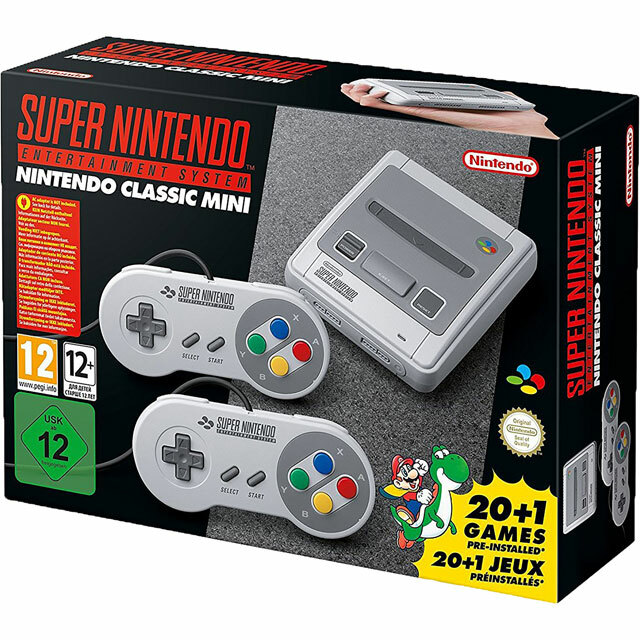 Rediscover the classics with this mini plug and play, retro Super Nintendo console. It has the original look and feel of the 90s home console, just a whole lot smaller, and it connects to your TV via a modern HDMI cable. There’s two controllers included too, so you can take on your friends in some old-school Super Mario Kart or team up to work your way through the likes of Donkey Kong Country. In fact, there’s 21 games pre-installed on the system, including timeless classics like Super Mario World, Street Fighter II, and The Legend of Zelda: A Link to the Past. Plus, the previously unreleased Star Fox 2 is also included, making for a cool piece of gaming history. Best bargain price on the net! I had shopped around for a while looking for a SNES Classic Mini, and found the best price for a NEW one on this site. Brand new, unopened, boxed and in fully working order. The SNES itself, it hasn't stopped being played daily since I got it. Well worth the money and I'm certainly not disappointed. It's a solid build, with 2 controllers that look just like the originals, but with todays build quality. Talk about nostalgia, this product takes you right back to days gone by. The games that come pre-loaded are the best of the best, and give you hours of non-stop fun! Highly recommend anyone to get one. Bought this for my Dad and it’s great!! He loves that it’s got so many ‘retro’ games on it which really makes it worth the money. Definitely one of the best purchases I’ve made in a long time. We’ve had loads of fun and have only had it a few days - I can see hours of fun will be had. Was good, but I stupidly thought the graphics would be more up to date ?? Very nostalgic, graphics are the same as they were which is brilliant, but was able to put it through a projector and not lose any quality. Outstanding price, and great bit of kit to relive your childhood. Plug in and play so much easier than modern consoles, has games like super Mario world, donkey Kong country, star fox which took me back to my childhood. Massive grin on my face when I turn this little box on.